Clonorchis sinensis, one of the most important food-borne parasite, is the etiological agent of the human disease known as cholangiocarcinoma. Cholangiocarcinoma causes considerable human morbidity and mortality of people worldwide [1-3]. Chronic infection by the carcinogenic parasite was responsible for other hepatobiliary diseases such as pyogenic cholangitis, cholelithiasis, cholecystitis and hepatic fibrosis. There are over 35 million people infected with Clonorchis sinensis in the world, among which 15 million people are living in China [4-6]. In spite of its public health threat, there are still few affordable and effective treatments to prevent this neglected tropical disease. In recent years, there has been a great deal of studies focused on the proteins required for the development of Clonorchis sinensis. These studies will shed light on the specific and vital targets that are for Clonorchis sinensis treatment and control strategies [7-9]. Human infection usually occurs through ingestion of raw or undercooked fluke-infested freshwater fish with metacercariae of Clonorchis sinensis . Clonorchis sinensis metacercariae eventually excyst in the duodenum of definitive host and migrate though the ampulla of vater into the bile duct, where they grow into adult worms, causing histopathological changes in liver and intrahepatic bile ducts [10,11]. Clonorchis sinensis adult worms are unable to synthesize the majority of their own lipids and cholesterol de novo [12,13]. Thus they have to depend on their hosts to survive and scavenge nutrient. However, the mechanism underlying lipids cargo delivery under such variable circumstances in Clonorchis sinensis is poorly understood. Endocytosis is cellular process in which cells use to remove large particles, solid or dissolved, receptors, extracellular material, plasma membrane proteins and lipids from the cell surface. After internalized from the cell environment, the cargo lipids are subsequently trafficked to a set of endosomes, early and late, to the lysosome for degradation, or shuttle cargo to the Golgi apparatus, or to recycling endosomes for return to the plasma membrane . In the endocytosis process, rab proteins, a group of GTPbinding proteins, have been proved playing an outstanding role as membrane organizers, integrating membrane tethering and fusion with cytoskeleton-dependent motility, through downstream activation of its effector protein [15,16]. Previous studies have indicated that at least 10 different Rab proteins were involved in Lipids traffic progress across a wide range of human and mouse cell types [17-20]. Sally et al. have proved that Rab18 serves important functions in the lipid droplets and further explored its role in the storage and trafficking of neutral lipids . Selma et al. found that Rab18 played essential roles in ER-Golgi trafficking . In this study, we have characterized the Clonorchis sinensis GTPase Rab18 (we named as CsRab18). The recombinant CsRab18 (rCsRab18) was expressed and purified. We explored structural analysis, mRNA and protein expression levels of CsRab18 in the four life stages of Clonorchis sinensis, we also did the immunolocalization and cellular function of CsRab18. We aimed to seek out possible biological functions of CsRab18 during different developmental stages, and its potential function to lipids trafficking. We infected freshwater fish Ctenopharyngodon idellus with Clonorchis sinensis metacercariae experimentally and freshwater snails Parafossarulus striatulus respectively, in our laboratory pool. Clonorchis sinensis adult worms were isolated from livers of infected rats, which were purchased from the animal center of Sun Yat-sen University. All experimental procedures were approved by the Animal Care and Use Committee of Sun Yat-sen University (permit number SCXK (Guangdong) 2009-2011) respectively. Total RNA was isolated from Clonorchis sinensis adult worms using the TRIZOL reagent (Thermo Fisher Scientific) under the technical instruction of manufacturers. Prime Script RTases was used for performing a reverse transcription reaction. The full-length of translated amino acid sequence of CsRab18 was used as query in a series of BLAST searches, to retrieve the serious of closely related sequences from a variety of GenBank genomic databases. The amino acid sequences alignments were performed using the ClustalX program and edited in GENEDOC (http://www.psc.edu./biomed/genedoc), respectively. Nucleotide and amino acid identities were established using GenBank and DNA lasergene software package (DNASTAR). Dendrogram analysis was performed by using the software Vector NT1 Suite8 Contig Express (InforMax). The CsRab18 was cloned into an expression vector pet30a (+) (NOVAGEN) to overexpress N-terminal 6 × His tagged proteins. CsRab18 protein and purify soluble in Escherichia coli. The PCR primers were designed to add a His tag at the N terminal of encoded proteins. RT-PCR product was digested with restriction enzyme and ligated into a Hind III and EcoRI sites of pET-32a (+), resulting in the pet30a-His-CsRab18 plasmid. All sequences of the recombinant genes were checked by sequencing at Invitrogen Company. The E. coli BL21 (DE3) cells transformed with pet30a-His-CsRab18 were grown at 37ºC in LB medium containing kanamycin (50 μg/ml). Cells were grown at 37°C until the A600 had reached 0.45. The expression of protein was induced by adding IPTG at a final concentration of 0.5 mM, followed by incubation at 30°C for 7 h with vigorous shaking at 250 rpm and the cells were harvested by centrifugation 3 h later. For the purification of the recombinant protein, the bacterial pellet was resuspended in 20 mM Tris-HCl, pH 8.0 and CsRab18 protein was purified by a single step of Ni-NTA metal-affinity chromatography under native conditions (NOVAGEN), under the procedure of the manufacturer. The purity of His-CsRab18 was characterized by 10% SDS-PAGE followed by Coomassie blue staining. The final concentration of purified CsRab18 was determined by the method of Bradford Protein Assay. SD rats divided into 4 groups, immunized with approximately 200 μg recombinant CsRab18 protein. CsRab18 was mixed with an equal volume of complete Freund’s adjuvant for each rat. The rats were boosted two week later with 100 μg recombinant CsRab18 mixed with incomplete Freund’s adjuvant. The anti-CsRab18 antibody titers in infected individuals of different groups were measured by enzymelinked immunosorbent assay, and antiserum was collected at week 8. The sections in paraffin wax were deparaffinised in xylene and hydrated in a collection of alcohol solutions. To minimize nonspecific staining, the section was incubated with protein block (Dako) for 15 min at RT. After washing with TBST (50 mM Tris (pH 7.5), 150 mM NaCl, 0.05% Tween-20), the specimen was incubated with anti-Cs Rab18 polyclonal antibodies (diluted 1:100 with 0.1% BSA in PBS) in a humid chamber at 4°C for overnight. The same dilution of preimmune mouse serum was used as a negative control. After four times of washes for 5 min with PBS containing 0.05% Tween 20, the samples were incubated with goat anti-mouse IgG labelled with red-fluorescent Cy3 (diluted 1:100 with 0.1% BSA in PBS, Molecular Probe, USA) in dark for 1 h at RT. The slides were cover slipped and observed under imaged using a ZEISS Axio Imager Z1 fluorescent microscope. To investigate mRNA expression pattern of CsRab18 at different developmental life stages of C. sinensis (adult worm, metacercaria, cercaria, and egg), we performed real-time quantitative PCR (qRT-PCR) accurately quantify the mRNA expression level. The primers for Csβ-actin (GenBank assession number EU109284) amplification were Forward primer: GGTTGAAGAGTTACGTGGTG; Reverse primer: CGGCGTTTATCATTGGTCRT-PCR. The primers for CsRab18 amplification were: Forward primer: CGTGAGCATGGCCTGATTT; Reverse primer: CTCATGAATGCACTTGGCCG was performed in a volume of 20 μl as we optimized previously. At the same time, negative controls without templates (NTC) were performed in parallel. RNA extraction and complementary DNA synthesis were performed as above. The real time PCR amplification was carried using the BIORAD iQ5 instrument (BioRad, USA) using the SYBR Premix ExTaq Kit (TaKaRa). The PCR amplification program as calculated using the 2-ΔΔCt method by iCycler IQ Multicolour Real-Time PCR Detection System (Bio-Rad, USA) procedure . The transcript of the adult worm was employed as the calibrator to evaluate relative expression levels of CsRab18 at different stages. All reactions were performed in triplicate and in at least three independent reactions. SPSS (version 17.0) software was used in the present study for statistical analysis. The Rab18 mutants (Q67L, GTP binding) were introduced by an overlap extension PCR based procedure in 293T cells to over express GFP fusion protein . The full-length CsRab18 or its mutant genes were sub cloned into pEGFP-C1 vector (Clontech). For sub cloning, pEGFP-C1 was first linearized by digestion with Hind III and EcoRI followed by ligation with Hind III and EcoRI digested CsRab18 or its mutants. Lipogenesis was measured in 3T3-L1 cells either overexpressing GFP, GFP-Rab18 or GFP-Rab18 (Q67L) vectors for Rab18 expression, treated or not with 100 nM insulin for 4 h. Cells were lysed in RIPA buffer (0.1% SDS, 1% Triton-X-100, 5 mM EDTA, 1 mM Tris HCl, 150 mM NaCl and 1% deoxycholate; pH 7.4) and intracellular triglycerides quantified using an InfinityTM Triglycerides Liquid Stable Reagent kit (Thermo Electron Corp., Grenoble, France). Triglyceride levels were normalized to total protein content. Data from 3T3-L1 cells were obtained from a minimum of three replicate wells per treatment from, at least, three independent experiments. Single comparisons were performed using the student’s t-test, while multiple comparisons were assessed by one-way ANOVA followed by a Newman-Keuls test using GraphPad Prism 4 (La Jolla, CA). Differences were considered statistically significant if P<0.05. SPSS version 17.0 software was used in the present study for all statistical analysis. Cloning and sequence analysis of the CsRab18 gene: Using degenerate primers based on nucleotide alignments of the Rab18 sequences from Mus musculus, Homo sapiens, Rattus norvegicus, Drosophila melanogaster, Plasmodium falciparum, Trypanosoma brucei and Leishmania major, a 648- bp genomic segment of the CsRab18 gene was amplified from Clonorchis sinensis by PCR. The PCR product was cloned, sequenced and hypothetically translated into a 215-aa sequence. Alignment of the amino acid sequences of the cloned protein (CsRab18) revealed the presence of highly sequence identity of Rab proteins . We used BLASTp in NCBI (http://www.ncbi.nlm.nih.gov/BLAST) and multi-alignment analysis by ClustalW. Alignment of sequences from all the nine proteins together revealed that CsRab18 (GenBank assession number: GAA51290.1) was with highly identity to Rab18s reported in other species, sharing a similarity of 61.0% identity to Mus musculus (BAF02874.1), 61.8% identity to Homo sapiens (AAP97170.1), 61.3% identity to Rattus norvegicus (AAH89957.1), 52.1% identity to Drosophila melanogaster (NP_524744.2), 53.7% identity to Plasmodium falciparum (AAF37004.1). 49.1% identity to Trypanosoma brucei (AAF37004.1) and 47.7% identity to Leishmania major (CAJ06472.1). The phylogenetic tree shown in Figure 1 indicates that the Drosophila melanogaster Rab18 is most related with CsRab18. Figure 1: (A) Sequence alignment of Rab18 with representative endosomal Rab GTPases Structural components of Rab18 can be identified by similarity to other Rab proteins. The conformational switch regions are highlighted in grey boxes. The C-terminal box highlights the CAAX box of Rab18 (Leung et al.) Horizontal lines above the sequence denote GTP-binding domains, an asterisk below the sequence denotes invariant residues and a dot below the sequence denotes a conservative amino-acid substitution. Amino acids implicated in GTP-GDP exchange and GTPase activity is identified in boldface type. Point mutations in these residues are predicted to result in a loss of GTPase activity leading to constitutive GTP binding and activation (Q67L), constitutive GDP binding (S22N) or nucleotide deficiency (N122I). Mm, Mus musculus (GeneBank accession NO.BAF02874.1), Hs, Homo sapiens (AAP97170.1), Ro, Rattus norvegicus (AAH89957.1), Dm, Drosophila melanogaster (NP_524744.2), Pf, Plasmodium falciparum (AAF37004.1) Tb, Trypanosoma brucei (AAF37004.1) and Lm, Leishmania major (CAJ06472.1). (B) The phylogram tree analysis of CsRab18 with the homologues. The striking feature of all Ras and Rab super family proteins belong to small G proteins super family, which is made up of six stranded β-sheet with five α-helices present on its sides, involved in the regulation and vesicle transport by shuttling between the GTP bound active and GDP bound inactive states. The GTPase region-COOH terminal is a hyper variable region followed by CAAX boxes (C is cysteine, A is usually an aliphatic residue and X is any amino acid), consisting of two cysteine residues (cysteine is prenylated) that are covalently attached to the Geranylgeranyl moieties and assist in the membrane insertion of Rabs [26,27]. Due to the highly conserved structure, the specific functions of each Rab small GTPases can be determined by its inactive GDP-bound and active GTP-bound forms. Rab protein function is dependent on the switch I and II regions which both make contact with the γ- phosphate of GTP. The GDP/GTP exchange factor is responsible for the catalytic conversion of the GDP-bound forms to GTP bound forms, When GDP-bound; the switch regions tend to be disordered, when binding GTP, the switch regions changes to adopt a structurally well-ordered state. The hydrolysis of GTP to GDP is catalysed by a GTPase-activating protein . The models that we generated for mouse (Figure 2A) and Clonorchis sinensis (Figure 2B) also showed typical 5 α-helices and 6 stranded β sheets with one anti parallel strand, it also show the greatest structural heterogeneity in their switch domains and the α3/β5 loop (a loop that connects α helix 3 with β sheet 5) that lies adjacent to the switch II domain, which is consistent with observed experimental data further validating the generated models (Figure 2) . Figure 2: Three-dimensional structure of CsRab18 presentation. (A) model generated from mouse; (B) model generated from Clonorchis sinensis. The ORF of CsRab18 was cloned into pET-30a (+) expression vector and the recombinants were inoculated in fresh Luria- Bertani (LB) medium, and incubated in a shaking incubator at 37°C until the OD600 was 0.45. Isopropyl-D-thiogalactoside (IPTG) was then added to a final concentration of 0.5 mM for the induction of expression. Recombinant fusion protein was expressed and bacterial cells were collected by centrifugation then purified by affinity chromatography using a Ni-NTA agarose gel column under native conditions. The supernatants and pellets and the purified protein were collected and subjected to 12% SDS-polyacrylamide gel electrophoresis (SDS-PAGE) analysis (Figure 3A) confirmed by Western blot (Figure 3B). The results show that the molecular weight of the expression product is 30 kDa, which corresponds to the predicted size of recombinant protein CsRab18. Figure .3: Expression, purification and characterization of CsRab18. (A) Expression and purification of pET-30a-CsRab18 protein. Molecular weight size marker (lane 1), lysate of E. coli cells with recombinant pET-30a-CsRab18 vector before induction with IPTG (lane 2) and after IPTG induction (lane 3), supernatant (lane 4) and precipitant (lane 5) of cell lysis with pET30a (+)-CsRab18 after induction, and the purified recombinant CsRab18 protein (lane 5). (B) Western blot analysis. 6xHis-CsRab18 proteins were subjected to 10% SDS-PAGE and immobilized onto the membrane then detected by anti-His antibody. From the immunofluorescence result, CsRab18 was specifically localized in the vitellarium and tegument of metacercaria. (Figure 4A, panels c and d), while we found no specific fluorescence in sections treated with naive control serum (Figure 4A, panels a and b). Figure 4: Immunohistochemical localization and Transcriptional pattern of CsRab18 and localization of its protein. (A) Immunohistochemical localization of CsRab18 in adult worm. Panels b and d were sections treated with anti-pET30a-CsRab18 serum; a and c were sections treated with naive control serum and imaged under the same conditions. CsRab18 was specifically localized in the vitellarium and tegument of metacercaria, while no specific fluorescence was found in sections treated with naive control serum (panels a and c). Magnification for the adult worm was x100. (B) Transcriptional level of CsRab18 at different developmental life stages of Clonorchis sinensis by qRT-PCR experiments. CsRab18 were expressed at all the four examined stages. Using Clonorchis sinensis β-actin as the normalization, the results showed that CsRab18 expressed at a highest level at the stage of metacercaria, the second is cercaria and egg, the expression level in the adult worm was the lowest. To analyse the mRNA expression levels of CsRab18 in four different developmental life stages of Clonorchis sinensis which include adult worm, metacercaria, cercaria, and egg we carried out qRT-PCR experiments with corresponding cDNA generated from total RNA respectively. The results of qRT-PCR demonstrated that CsRab18 were expressed at all the four examined stages (Figure 4B). Using Clonorchis sinensis β-actin as the normalization, the results showed that CsRab18 expressed at a highest level at the stage of metacercaria, the second is cercaria, and egg the expression level in the adult worm was the lowest. To validate the promotion effect of CsRab18 to cellular lipogenic activity and changes in the average speed of LDs in Rab18 over-expressing 3T3-L1 cells, we transiently transfected with a vector coding for either Rab18 or the constitutive activated mutant CsRab18 (Q67L). Our results revealed that, under basal conditions, CsRab18 overexpression provoked a 38.7% increase in triglyceride content, and Insulin administration did not induce further increases. The same stimulatory effect of Rab18 on basal lipogenesis was reproduced by transfection of 3T3-L1 cells with the constitutively activated mutant CsRab18Q67L (Figure 5). Figure 5: Effect of Rab18 overexpression and silencing on insulininduced lipogenesis. The effect of CsRab18 over expression on basal and insulin-induced lipogenic activity in 3T3-L1 adipocytes was assessed by transfecting cells with GFP-tagged versions of wild-type CsRab18 or the constitutively active mutant CsRab18 (Q67L) for 48-72 h. Control cells were infected with a vector expressing GFP. GFP was transfected to evaluate the percentage of transfected cells. The transfection efficiencies were higher than 90% for each experiment prior to further experimental manipulation. 4 h later, 3T3- L1 cells were lysed and intracellular TAG content was quantified. TAG content was normalized to total protein content and expressed as the mean ± SD of 6 independent experiments. The adult Clonorchis sinensis flukes inhabit the biliary tract, generally localizing within the human intrahepatic bile duct and provoke pathologic changes in hepatobiliary tissues, such as, epithelial hyperplasia and periductal fibrosis. Long Chain Fatty Acids (LCFA) play important roles in various cellular processes, including membrane synthesis and control of energy supply. During the life cycle of Clonorchis sinensis, adult worms express high levels of lipid binding proteins and are incapable of de novo synthesis of fatty acids and cholesterol. Thus, they depend largely on their host to sequestrate and utilize of lipids to survive. In this metabolic context, Clonorchis sinensis. Ras-related Rab proteins have been suggested to play an important role in the exchange of lipids between parasite and host organism. Previous studies showed that intracellular trafficking in mammalian cells is specifically regulated by Rab protein, a large family of small GTPases that control membrane identity and vesicle budding, uncoating, motility and fusion, along with their effectors. Rab GTPases family constitute the largest family of small GTPases, with more than 60 members in the human genome . Rab proteins and their effectors localize in distinct intracellular compartments where they carry out different functions in transport such as vesicle formation, vesicle tethering, fusion, organelle motility and finally, tethering/docking to their target membranes . Rab18 was first characterized from mouse pituitary AtT20 cells in the condition of a PCR-based strategy to generate cloning members of the Rab family from rodent pituitary . The cDNA sequence isolated from AtT20 cells encoded for a 23.5-kDa protein with conserved GTP-binding motifs and sequence that are feature of the Rab family of proteins. Kukimoto-Niino et al. obtained the first X-ray diffraction pattern of protein (Rab18) crystals, which confirmed the high similarity of Rab18 with other family members of the Rab proteins. Rab18 has also been proved to attach in the LD (lipid droplets) surface of both adipocytes and non-adipocyte cell lines. This GTPase has been found to regulate diverse intracellular membrane trafficking processes in eukaryotic cells . In adipocytes, Rab18 is recruited to LDs surface following the stimulation of lipolysis in 3T3-L1 cells and the specific localization of Rab18 around LDs [21,34]. In this study, we identified a novel Ras related Rab protein of Clonorchis sinensis and characterized the biochemical and functional properties of this protein. Although GTP binding proteins have been identified in various developmental stages of the parasite and several genes encoding Rabs of Clonorchis sinensis have been cloned, approaches to characterize biochemical properties and biological roles of the Rab18 have been very limited . 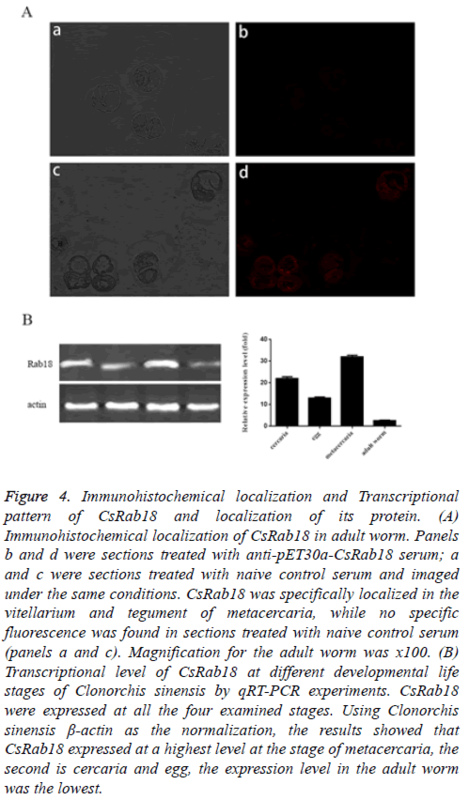 Thus, we have isolated and characterized Rab18 homologue from Clonorchis sinensis, CsRab18. It contains 648 bp encoding 215 amino acids. Alignment of sequences of the cloned protein along with nine Rab18 homologue proteins reveals that CsRab18 share highly identity with Rab18 sequences of other organisms. Because Rab18 play multiple roles in cellular signalling processes, we supposed that CsRab18 could be widely expressed in developmental life stages of this parasite. As our results of the qRT-PCR, we can conclude that CsRab18 transcripts were expressed in all the four stages, it expressed at a highest level at the stage of metacercaria, the second is cercaria and egg, the expression level in the adult worm was the lowest. We supposed that CsRab18 may be involved in nutrition absorption, and proliferation during its life cycle that results in the metabolism of this parasite. Immunolocalization using immunofluorescence microscopy show that CsRab18 was specifically localized in the vitellarium and tegument of metacercaria. The tegument of trematodes plays a key role in nutrient absorption, exerts secretory functions, and protects the parasite against the immune system of the host, indicating that CsRab18 may play vital roles in the nutrient absorption and secretory function . To investigate the specific contribution of CsRab18 to LD physiology, we carried out CsRab18 overexpression studies in 3T3-L1 cells. Quantification of the lipogenic activity in Rab18- expressing 3T3-L1 cells revealed that, CsRab18 overexpression provoked a 38.7% increase in triglyceride content and insulin administration did not induce further increases. CsRab18Q67L overexpression produced the same stimulatory effect. Therefore, we expect that CsRab18 have function in the involvement of lipids in host-pathogen interactions with potential applications in fundamental and applied research. Shin HR. Epidemiology of cholangiocarcinoma: an update focusing on risk factors. Cancer Sci 2010; 101: 579-585. Sripa B. Liver fluke induces cholangiocarcinoma. PLoS Med 2007; 4: e201. Young ND. Unlocking the transcriptomes of two carcinogenic parasites, Clonorchis sinensis and opisthorchis viverrini. PLoS Negl Trop Dis 2010; 4: e719. Lun ZR. Clonorchiasis: a key foodborne zoonosis in China. Lancet Infect Dis 2005; 5: 31-41. Qian MB. Clonorchiasis. Lancet 2016; 387: 800-810. Lai DH. Current status of Clonorchis sinensis and clonorchiasis in China. Trans R Soc Trop Med Hyg 2016; 110: 21-27. Pak JH. Proteomic analysis of differentially expressed proteins in human cholangiocarcinoma cells treated with Clonorchis sinensis excretory-secretory products. J Cell Biochem 2009; 108: 1376-1388. Fan Y. Molecular cloning, expression, and immunolocalization of the NAD (+) dependent glycerol 3-phosphate dehydrogenase (GPD) from Clonorchis sinensis. Parasitol Res 2011; 109: 621-626. Wang X. Clonorchis sinensis enolase: identification and biochemical characterization of a glycolytic enzyme from excretory/secretory products. Mol Biochem Parasitol 2011; 177: 135-142. Hong ST. Turnover of biliary epithelial cells in Clonorchis sinensis infected rats. Korean J Parasitol 1993; 31: 83-89. Rim HJ. Clonorchiasis: an update. J Helminthol 2005; 79: 269-281. Huang L. Gene/protein expression level, immunolocalization and binding characteristics of fatty acid binding protein from Clonorchis sinensis (CsFABP). Mol Cell Biochem 2012; 363: 367-376. McManus DP. Biochemistry and physiology of Echinococcus. In: Thompson RCA. Biology of Echinococcus and hydatid disease. 1986. Wandinger-NA, Zerial M. Rab proteins and the compartmentalization of the endosomal system. Cold Spring Harb Perspect Biol 2014; 6: a022616. Zerial M, McBride H. Rab proteins as membrane organizers. Nat Rev Mol Cell Biol 2001; 2: 107-117. Seabra MC, Wasmeier C. Controlling the location and activation of Rab GTPases. Curr Opin Cell Biol 2004; 16: 451-457. Umlauf E. Association of stomatin with lipid bodies. J Biol Chem 2004; 279: 23699-23709. Fujimoto Y. Identification of major proteins in the lipid droplet-enriched fraction isolated from the human hepatocyte cell line HuH7. Biochim Biophys Acta 2004; 1644: 47-59. Liu P. Chinese hamster ovary K2 cell lipid droplets appear to be metabolic organelles involved in membrane traffic. J Biol Chem 2004; 279: 3787-3792. Brasaemle DL. Proteomic analysis of proteins associated with lipid droplets of basal and lipolytically stimulated 3T3-L1 adipocytes. J Biol Chem 2004; 279: 46835-46842. Martin S. Regulated localization of Rab18 to lipid droplets: effects of lipolytic stimulation and inhibition of lipid droplet catabolism. J Biol Chem 2005; 280: 42325-42335. Dejgaard SY. Rab18 and Rab43 have key roles in ER-Golgi trafficking. J Cell Sci 2008; 121: 2768-2781. Livak KJ, Schmittgen TD. Analysis of relative gene expression data using real-time quantitative PCR and the 2 (Delta C (T)) methods. Methods 2001; 25: 402-408. Ho SN. Site-directed mutagenesis by overlap extension using the polymerase chain reaction. Gene 1989; 77: 51-59. Martin S, Parton RG. Characterization of Rab18, a lipid droplet-associated small GTPase. Methods Enzymol 2008; 438: 109-129. Hutagalung AH, Novick PJ. Role of Rab GTPases in membrane traffic and cell physiology. Physiol Rev 2011; 91: 119-149. Mulukala NSK, Gunda SK, Shaik M. Comparative modelling of Rab6 proteins: identification of key residues and their interactions with guanine nucleotides. J Mol Model 2013; 19: 1891-1900. Eathiraj S. Structural basis of family-wide Rab GTPase recognition by rabenosyn-5. Nature 2005; 436: 415-419. Garcia-SI, Tcherniuk S, Kozielski F. The structure of human neuronal Rab6B in the active and inactive form. Acta Crystallogr D Biol Crystallogr 2006; 62: 725-733. Chavrier P, Goud B. The role of ARF and Rab GTPases in membrane transport. Curr Opin Cell Biol 1999; 11: 466-475. Waters MG, Pfeffer SR. Membrane tethering in intracellular transport. Curr Opin Cell Biol 1999; 11: 453-459. Yu H, Leaf DS, Moore HP. Gene cloning and characterization of a GTP-binding Rab protein from mouse pituitary AtT-20 cells. Gene 1993; 132: 273-278. Vazquez-MR. Rab18 inhibits secretory activity in neuroendocrine cells by interacting with secretory granules. Traffic 2007; 8: 867-882. Pulido MR. Rab18 dynamics in adipocytes in relation to lipogenesis, lipolysis and obesity. PLoS One 2011; 6: e22931. Jia F. Molecular characterization and expression of Rab7 from Clonorchis sinensis and its potential role in autophagy. Parasitol Res 2013; 112: 2461-2467. Xiao SH. Effect of single-dose oral artemether and tribendimidine on the tegument of adult Clonorchis sinensis in rats. Parasitol Res 2009; 104: 533-541.